ST. GEORGE — Want to show your smarts? Have fun? Win a $50 prize? If yes, then you are a prime candidate for the PAWS (Providing Animals With Support) Quiz Night fundraiser. The Quiz consists of four multiple guess questions in five categories, 20 total questions—each worth one point. There is also bonus PAWS question worth three points. Teams have two minutes to answer each question. The use of any electronic or other devices to help answer questions is prohibited. First place wins $50. Second place a $25 gift certificate to ‘Bout Time. Third place wins two $5 gift certificates to PAWS Thrift Store. Quiz Night is hosted by Tom Garrison. He is a five-year veteran volunteer at PAWS, pet parent (two cats, Bob and Molly), and 25 year explorer of the southwest who has published three hiking books. Come early to get your seat. PAWS is a non-profit animal rescue/shelter organization based in St. George. It has rescued and adopted out thousands of cats and dogs since 2003. It is a volunteer organization which also offers a low cost spay/neuter program. 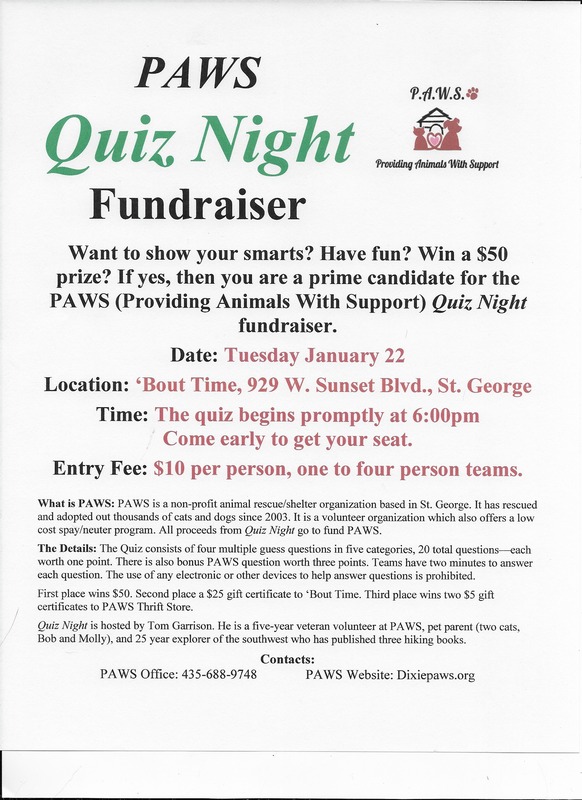 All proceeds from Quiz Night go to fund PAWS. What: PAWS Quiz Night fundraiser. When: Tuesday, Jan. 22, 2019, 6 p.m.
Where: ‘Bout Time, 929 W. Sunset Blvd., St. George. Entry Fee: $10 per person, one to four person teams.